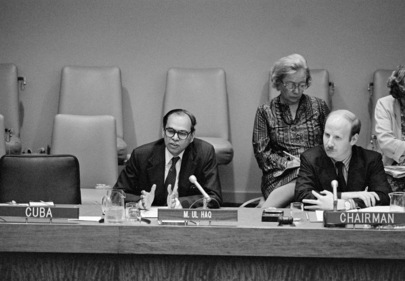 The 1981 Annual Conferences for Non-Governmental Organizations marked its second day with morning and afternoon panels and addresses by Mabub Ul Haq of the World Bank and Louis Wiltshire of the United Nations Conferences on New and Renewable Sources of Energy. Organized by the UN Department of Public Information (DPI), the 3-day Conference deals with several economic questions related to energy. Mabub Ul Haq (left), Director, Policy Planning and Programme Review Department, the World Bank, speaking at the meeting this morning. Conference Chairman Philip Oke is at right.